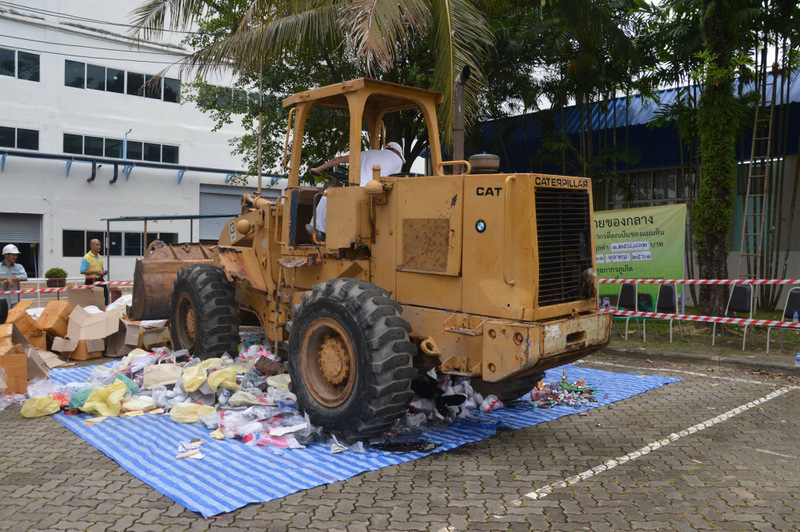 PHUKET: More than 2,500 contraband items, including fake brand-name goods and illegally imported cigarettes, were destroyed at the Saphan Hin incinerator yesterday (Oct 11). 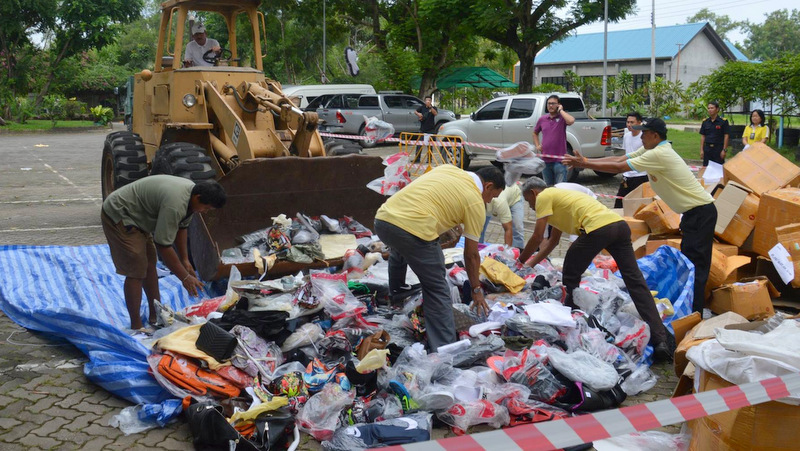 The items destroyed, precisely 2,669 pieces in all, had a recorded value of B1,258,832.10, Customs officials noted. 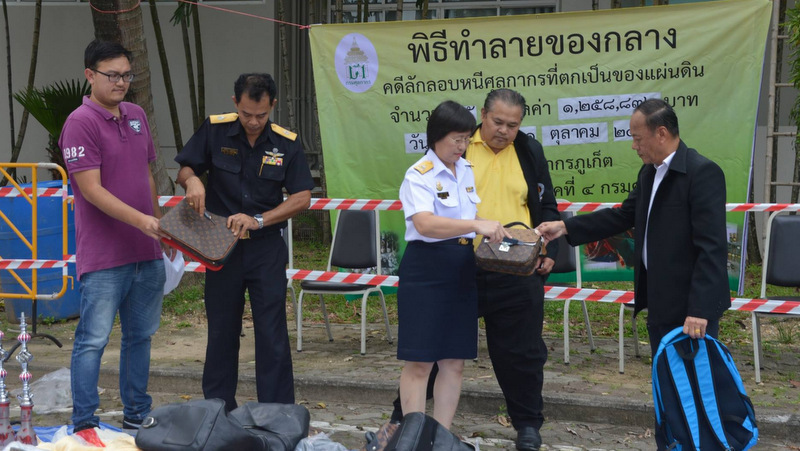 Leading the event held to highlight the seizure and destruction of illegal goods was Kanjana Suwanicho of Phuket Customs House. All the items had been apprehended in search-and seizure raids, and included fake brand-name shoes, clothes, hats and bags seized as forbidden imports, numbering 2,506 items in total. A further 62 items, comprising cigarettes, tobacco and other products to be ingested by use of baraku pipes, were also destroyed. Ms Kanjana noted that government has laid down a main policy to target such contraband goods in the Kingdom to highlight the importance protection and enforcement of intellectual property laws, especially the Trademark Act of 1991. “This applies mostly to pirated copyright goods and fake brand-name items,” he said. Prayoth Poonnoi, Director of Regional Customs Bureau 4, yesterday explained that under orders from senior Customs officials Krisada Jinawijarana and Chuchai Udomphot, Customs officials across the country had been ordered to crack down such illegal goods. “They have ordered every department to checking strictly on pirated copyright goods and smuggled goods in the area,” he said. The branded "items" [edited]  is made in China or other third world countries anyway because of cheap labour and materials just to boost profits of multi national companies at the expense of the poor nations. China gets away with copyright and patent theft and India pays no regard to patent law, so good on them I say! This must represent the merchandise confiscated at the stores that refused to pay tea money to certain officials and local police. No matter where you are in Phuket, within 5 minutes you can go find a store that is filled with fake crap, shorts, shirts, watches ...everything. I will never buy anything of value here, because I don't trust the authenticity of anything, regardless of the store. This is 0.09 % of all pirated goods in Phuket. Walk and look around in Patong. Stand still and turn yourself 360 degrees at any spot. All shops with fake goods. I am sure the shop owners don't know anything about the Trademark Act 1991. Just the idea that they know. hahaha. And if they know it is not in their daily way of sales business-thinking. They calculated confiscations in their sales prices.